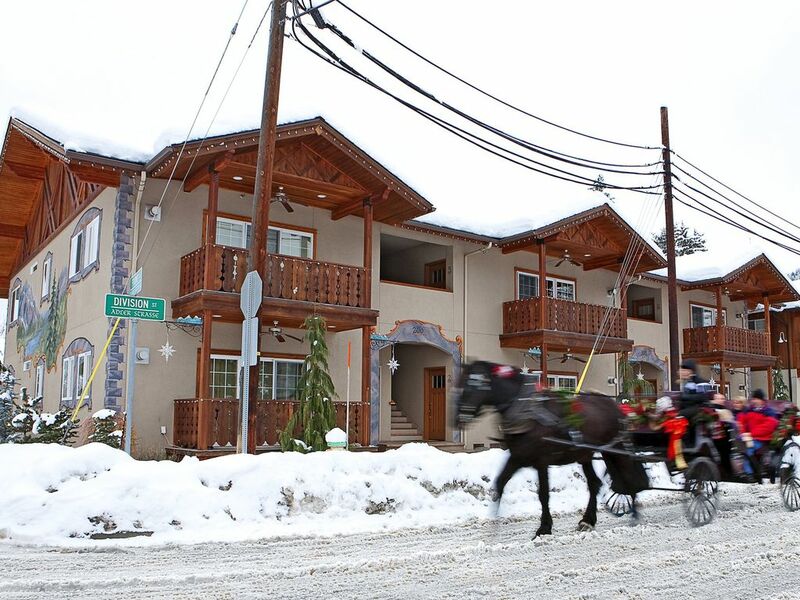 Looking to explore downtown Leavenworth while staying in a beautiful home? If so, we might have the perfect place for you. Harlin Haus is a brand new ground level 2-bedroom luxury condo in downtown Leavenworth, Washington. It is fully (and beautifully) furnished and equipped for your family to experience all four of the seasons in the fascinating Bavarian Village. The kitchen of Harlin Haus is decked out in a deep beautiful brown cabinetry with newer appliances. Prepare your meals here or take a short stroll further into town where you'll find fine dining restaurants. The master suite has a king sized log-made bed with a private bathroom. The second bedroom holds a comfortable queen sized bed for your accompanying guests. We allow up to 6 total people, but you'll have to throw the other two on the couches in the living room. Speaking of the living room, cozy up at the end of the night in front of the gas fireplace. Throw in your favorite Blu-Ray or DVD and enjoy it on the oversized flat screen TV. With a private parking garage, you'll have no worries when traveling. If you're from the big city, we know how stressful parking can be so we try to make it easier for you. Enjoy the covered front porch with a gas BBQ if you feel like grilling. We provide His and Her bicycles for you to ride around the village and explore - That is, if you're planning a romantic getaway. The Harlin Haus is only 2 blocks away from the scenic Wenatchee River where you can not only enjoy the views, but also fishing and other recreational activities. When booking any of our properties in the Bavarian Village, you'll have the chance to spend your vacation as if you're in the mountain villages of Old Europe. As it's right smack dab in the middle of Leavenworth, you won't miss out on any of the fun! I loved our stay at Harlin Haus. It made for a wonderful ladies retreat with my sister and daughters. We loved snowshoeing and shopping. Harlin Haus was a perfect location to visit Starbucks, Fresh Burger (yum) and a nice stroll to the shops and restaurants. The condo was very nice and had tons of room and seating for all of us. We were able to walk to everything so we didn’t have to battle traffic. Love the private garage that kept the snow off of our SUV and it was big enough to fit our Expedition EL with no problem. What a beautiful little condo! The furnishings were beautiful and had a nice upscale feel. You couldn’t ask for a better location, a minute or two walk and you are right in the heart of downtown! Great view of the mountains right out the back door. We will definitely be back! This condo in Leavenworth was an awesome place to stay. The location is ideal with all of leavenworth's downtown amenities within short walking distance. Also nice to have such a short walk (not drive) after adult beverages over dinner. We were expecting the convenient location, but were pleasant surprised at how upscale the condo felt. We were staying with another adult couple and each had our own bathroom and queen/king bed, which were very comfortable. We also enjoyed sitting and unwinding around the fire place in the evenings. I would also recommend checking out the snowmobile tours as it was a very fun experience. This place is amazing! Clean and inviting! Prime location! Comfortable beds! Everything you could want or need. We'll be back for sure! Absolutely loved our stay at Harlin Haus. It was so nice to be able to walk to town. The beds were very comfortable. Will definitely stay here again, in fact I look forward to it.